An ingrown toenail occurs when a sharp corner of the toenail is curved downward and grows into the skin, usually at the nail borders (the sides of the nail). This “digging in” of the nail irritates the skin, often creating pain, redness, swelling, and warmth at the spot where the nail curls into the skin. If left untreated, the inflamed area can begin to grow extra tissue or drain yellowish fluid. If an ingrown nail causes a break in the skin, bacteria may enter and cause an infection in the area, which is often marked by drainage and a foul odour. However, even if your toe isn’t painful, red, swollen, or warm, a nail that curves downward into the skin can progress to an infection. Ingrown toenails happen when the toenail has become cracked or frayed, forming sharp spikes that push into the skin and set up an infection. When feet are hot they produce a lot of sweat. When feet spend a lot of time inside shoes (especially inside joggers and ‘sneakers’ with synthetic socks), the hot sweaty environment softens the toenail, making it more likely to break and form spikes. This provides an ideal environment for infection to start. Tight shoes, which press the skin at the side of the nail onto the sharp spike, also make the situation worse. Until the nail grows long enough so that the end is beyond the skin at the end of the toe, infections can come back even when they are treated. 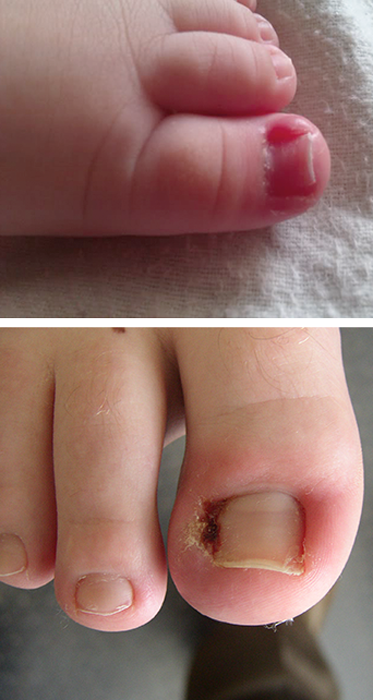 Does your child has an ingrown toenail? An ingrown toenail is a nail that’s pressing or growing into the skin. The problem can show up on any toe, although thebig toe is the one most commonly affected. A typical early sign is redness or swelling of the skin at the edge of the nail. Your toddler’s toe will be tender and possibly quite painful, especially when rubbed by a shoe or a tight sock. If your toddler is old enough to talk, he may tell you that his foot hurts. Otherwise, he may cry and point to his toe or foot. You may also notice him limping or grimacing when he walks. If an ingrown nail gets infected, you’ll see a blister containing white or yellowish fluid, surrounded by reddened skin. If the blister breaks, there may be some discharge. The swelling or redness may increase as the nail grows. Consult a Podiatrist for the best treatment for Ingrown Toenails.Contact us at Children’s Podiatry for effective and professional ingrown toenail treatment.